In my travels of teaching the how-to’s and no-no’s of seed starting, I find the following to be the most common issues folks are facing. Don’t miss my P.S.! 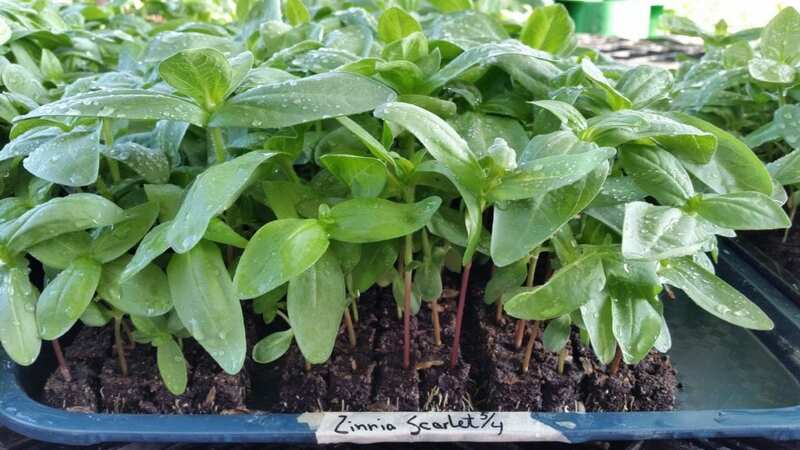 Zinnia seedlings ready to be planted. They are 3 weeks old in this photo. Seeds should be started just a few weeks before the transplants can be planted outdoors in the garden. When seedlings reach 4-to-5 inches, they are at their very best size for planting. Once they grow larger, it is difficult to maintain them indoors—even with grow lights. The right time to plant a specific plant outdoors depends on if it is a cool-season or a warm-season plant. Cool-season plants include those such as snapdragons, sweet peas, dill, kale, and lettuce. They prefer to be planted and grown in cool conditions like early spring. Warm-season plants include those like zinnias, sunflowers, basil, tomatoes, and squash. They are planted outdoors once nighttime temperatures are staying above 60 degrees. They prefer summer like conditions. When planting seeds outdoors in the garden, success or fail almost always is determined by the temperature. Requirements depend on if it is a warm-season or cool-season seed. Warm-season seeds such as zinnias, cockscomb, beans, squash, and basil need warm-to-hot soil to sprout. Soil warms much slower than air temperature. The best way to know when to plant warm-season seeds outdoors in the garden is when nighttime temperatures have been staying above 60 degrees for several weeks. Note warm-season seeds are planted later than warm-season transplants. For most areas this is 3-4 weeks after the last expected spring frost. If you plant earlier you can have little to no sprouting occur. Cool-season seeds such as poppies, larkspur, lettuce, peas, and dill need cool soil to sprout. Fall and early spring conditions tend to be perfect with warm days but the nights are still cool-to-cold. Planting these seeds in warm -to-hot weather prevents sprouting. Every seed has a preferred method of sprouting. Following that method is the easiest way to have success. If you don’t know which way the seed you have prefers, enter the seed name into a search engine with “sowing instructions”. 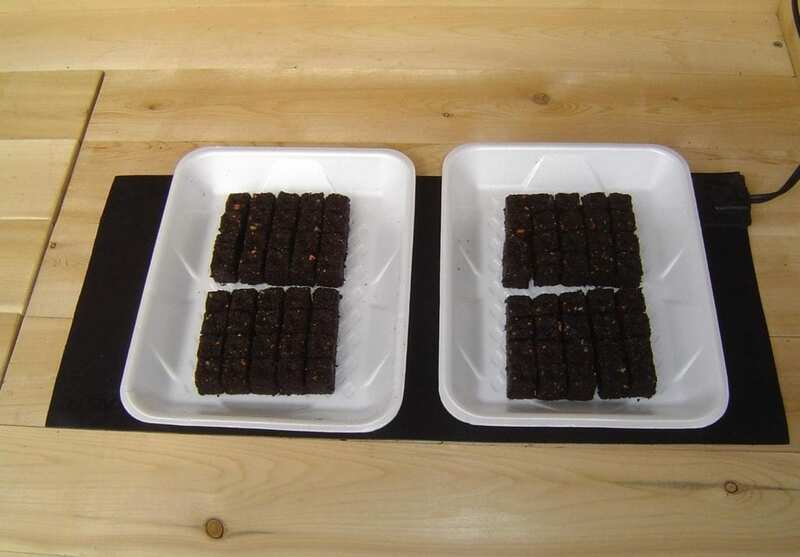 A seedling heat mat has a built-in thermostat that maintains 15-20 degrees warmer than the surrounding air temperatures. Perhaps the leading cause of poor sprouting and survival of seedlings indoors is cool soil. Most seeds sprout best at 75 to 85 degrees. Soil temperature runs approximately 15 to 20 degrees cooler than the surrounding air temperature. If your house temperature hoovers at 70 degrees, that means that the soil is around 55 degrees, to cool to sprout seeds. A seedling heat mats is a small investment when you consider your efforts and how many seeds you are losing. More on heat mats. 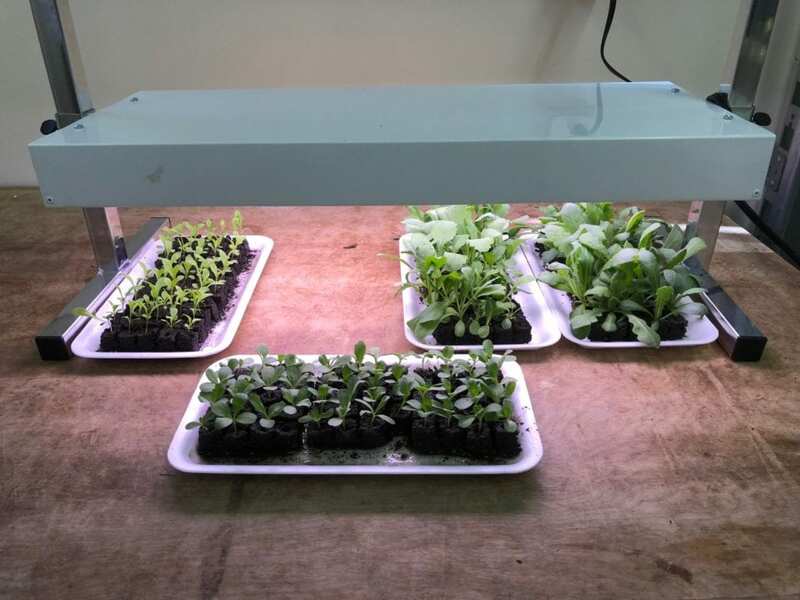 Our tabletop grow light can support 240 small soil blocks until they are ready to go to the garden. Baby plants need 16 hours a day of bright light to grow into a healthy transplant. We don’t have 16 hours of natural sunlight a day. When plants don’t get enough light they stretch looking for it. This is the cause of tall lanky plants; they stretch as they search for light. Short stocky plants out produce tall lanky plants, are more resistant to disease and pests and just healthier all around. Click here for a grow light. Want to learn more about seed starting? Checkout my online course Seed Starting Made Easy! I hope this clears the way to a successful seed-starting year! P.S. Another game changer: some seeds need light to sprout (don’t cover with soil) and some seeds need darkness to sprout (cover with soil). Don’t know which way your seed prefers? Ask on a search engine. Founder of The Gardener’s Workshop and Flower Farming School Online . Author of Vegetables Love Flowers, Cool Flowers, and The Easy Cut-Flower Garden . Connect with Lisa on Facebook and Instagram ! Thank you for sharing your knowledge. Love watching little sprouts grow up healthy and strong.